BANGI, 26 Oct 2013 – A total of 6,830 students of The National University of Malaysia (UKM) are graduating at its 41stConvocation ceremony beginning today. They are made up of 444 doctoral degree recipients, 4,205 masters, 306 medical doctors and dental specialists, 1,776 bachelor degrees and 96 graduate diplomas. 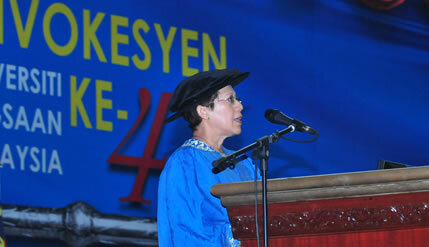 UKM Vice-Chancellor Prof Tan Sri Dato’ Seri Dr Sharifah Hapsah Syed Hassan Shahabudin said with the new graduates the university’s alumni now stands at 163,853 members. Speaking at the first session of the convocation ceremony here today, Prof Sharifah Hapsah expressed confidence the extensive network can contribute greatly not only to Malaysia but also to the whole world. UKM alumni have already established its overseas chapters in a number of cities and regions in their respective countries especially in Indonesia and Thailand. UKM has also now become the first choice of students from 64 countries. Since its establishment 43 years ago, the university has been able to maintain its status as a research university for seven years in a row. UKM has also responded to the aspirations of the National Transformation Plan which demands research universities build an innovation culture to contribute to economic growth and social well-being of the country and its people. UKM has worked with all parties from government, the industry and the community within and outside the country to explore new approaches to produce graduates with skills in innovation, technology management and entrepreneurship. Prof Sharifah Hapsah said the new approach to integrate education with research programme and commercialisation of ideas will result in innovations that can be marketed. That approach occurs in environments enriched with innovation and support in the development of prototypes, intellectual property registration and business model development. Students and researchers are also supported by investors and industry. UKM’s Graduate School of Business – recognised as a top business school, has also introduced a number of methods that ensure graduates meet the current market requirements. Programmes on Innovation and Entrepreneurship have been set up at the Bachelors and Masters levels, Prof Sharifah Hapsah said.